Bute Inlet -- Whatever it was, it wasn't your average beachcomber. Three Vancouver herring fisherman all saw what might be the latest sighting of the legendary and elusive (illusive?) Sasquatch. While fishing in Bute Inlet, about 115 miles north of Vancouver BC, last week Nick Pisac of 2061 East Fourth, said he looked out of the galley window and spotted "the thing" walking slowly along the beach. "We were about 500 feet from shore and it was very clear and cold," he said, "We could see it perfectly." Pisac said crewmen Luka Burmas and Peter Spika and himself watched the creature for about 90 seconds. "The thing stood about ten feet tall and was sort of lightish gray," e said. "We all waved but it didn't wave back." Peter Spika's brother Frank, skipper of the Tracy Lee, said the mate became so excited he shoved the engine into forward instead of reverse. 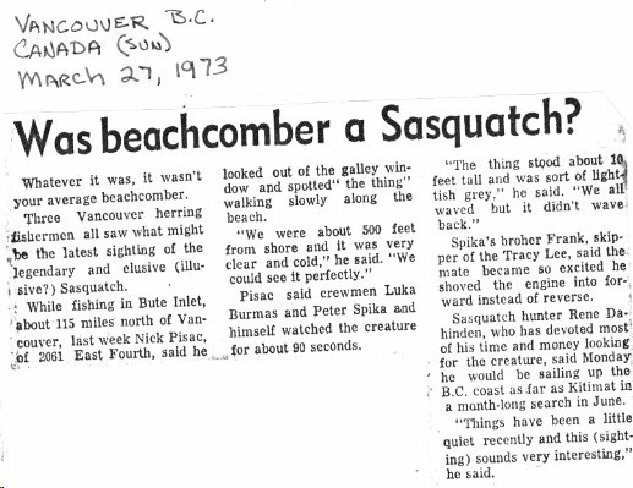 Sasquatch hunter Rene Dahinden, who has devoted most of his time and money looking for the creature, said Monday he would be sailing up the British Columbia coast as far as Kitimat in a month long search in June of this year, 1973. "Things have been a little quiet recently and this sighting sounds very interesting," he said.